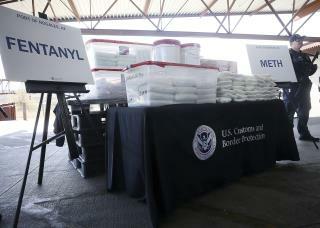 (Newser) – US Customs and Border Protection officials announced Thursday their biggest fentanyl bust ever, saying they captured nearly 254 pounds of the deadly synthetic opioid from a secret compartment inside a load of Mexican produce heading into Arizona, the AP reports. The drug was found hidden Saturday morning in a compartment under the rear floor of a tractor-trailer after a scan during secondary inspection indicated "some anomalies" in the load, and the agency's police dog team alerted officers to the presence of drugs, Nogales CBP Port Director Michael Humphries said. Most of the seized fentanyl with an overall street value of about $3.5 million was in white powder form, but about 2 pounds of it was contained in pills. Agents also seized nearly 395 pounds of methamphetamine with a street value of $1.18 million, Humphries said. 245 lbs? that's a average wednesday for rush limbaugh. From China, to Mexico, to wreak havoc in the US.